The Level 7 Executive Diploma in Hospitality and Tourism Management provides an industry relevant postgraduate academic progression route for those who want to build on their bachelor's level qualification or improve their career progression. 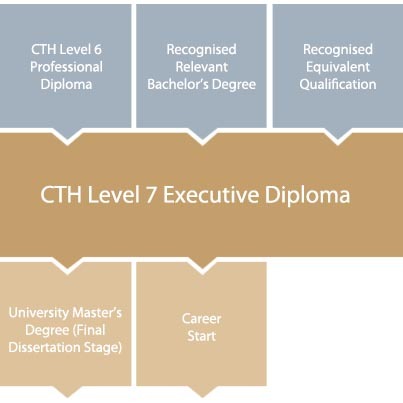 The postgraduate Level 7 Executive Diploma assessment methods have been designed to enable students to demonstrate Level 7 outcomes for this level of qualification. Assessment involves investigative assignments, presentations and action research activities. The assessment of candidates' work is centre-based, against the specified learning outcomes and directed by CTH. All centres are expected to demonstrate a robust assessment system. In order to manage the quality of assessment within approved centres, CTH carries out external marking and moderation of assessments. Minimum of a recognised university degree in a relevant hospitality, tourism or management subject. Equivalence for non-UK degrees should be evaluated though NARIC. Non-graduates and holders of non-relevant degrees - A minimum of 5 years of evidence work experience at managerial level within the hospitality & tourism industries. (Subject to individual approval by CTH). Successful completion of the CTH Level 6 Professional Diploma. All applicants must hold at least IELTS 6.0 or other evidence of competence in English at this level. 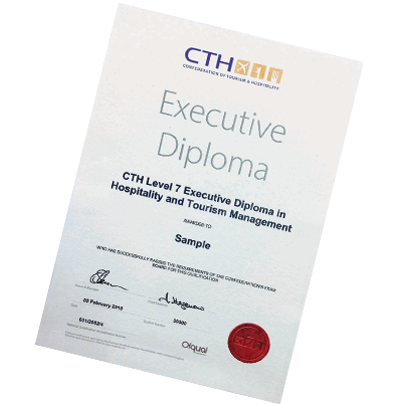 CTH Executive Diploma graduates have access to a range of universities to convert their Executive Diploma into a Masters Degree. Some of these are shown below but for full details click here.